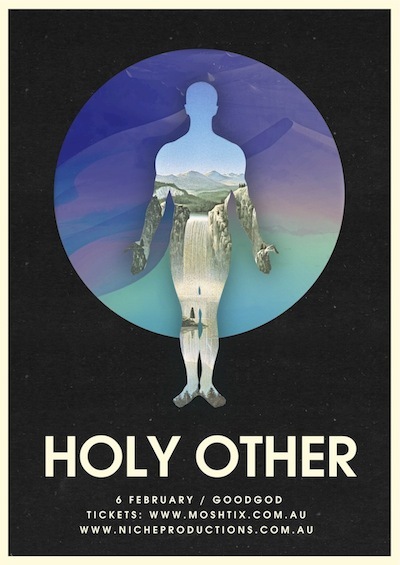 Niche Productions announces the exclusive Sydney side show for Manchester Producer Holy Other. Performing in near darkness and preferring to keep his identity a secret is all part of Holy Other’s mystery, which led him to hit the road recently with Beach House, Amon Tobin and Thom Yorke & Nigel Godrich’s Atoms For Peace. It’s time for this major talent to step out of the shadows. Taking the alien kinetics of UK Garage, the euphoric highs of vocal house and the slow, sensuality of R&B, Holy Other has created a sound that’s as melancholic as it is beautiful, spectral and yet slightly at unease with itself. Don’t miss this exciting talent on his Sydney Laneway sideshow in the intimate surrounds of Goodgod Small Club.